At the moment no Thai is not talking about “บุพเพสันนิวาส Buppesannivas”. It is the most popular Thai drama series of all time! This TV series is based on the history that took place in year 1682 which was in the era of the King Narai of Ayutthaya Kingdom (year 1656 to 1688). 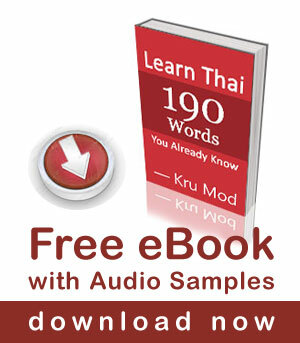 Thai language that is spoken in that era is different from Thai language that is spoken nowadays. If you would like to be in the trend you should try using these phrases with your Thai friends. Love destiny brought us together. Ex. ออเจ้าชื่ออะไร /aw-jâo chûe à-rai?/ = What is your name? ข้าชอบออเจ้า /kâa châwp aa-jâo/ = I like you. “เวจ /wét/” is an ancient toilet (privy) where you have to be in a squad position. Instead of saying the normal Thai phrase ไปอึ /bpai ùe/ or ไปทำธุระหนัก /bpai tam tú-rá-nàk/ or ไปเข้าห้องน้ำ/bpai kâo hâwng-náam/ you could try “ไปเวจ /bpai wét/” and wait to see your Thai friends’ reaction. Watch the scene where the main charactor talking about going to the Wet. In case you are interested to watch this series you can watch all previous episodes on Channel 3’s YouTube here.